Theodore Teddy Roosevelt the Man in the Arena Quote 8x10 Framed Picture with Black Border by WeSellPhotos at My Athenas. MPN: B013I1TL52. Hurry! Limited time offer. Offer valid only while supplies last. This 8'' x 10'' framed picture features one of Theodore Teddy Roosevelt's most famous quotes, The Man in the Arena. It comes with a shiny black frame. 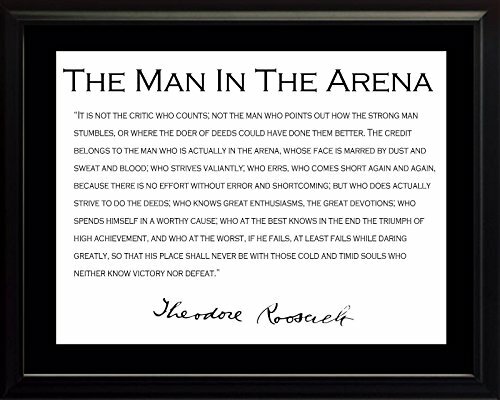 This 8" x 10" framed picture features one of Theodore Teddy Roosevelt's most famous quotes, The Man in the Arena. It comes with a shiny black frame. The photograph features a black border. If you have any questions about this product by WeSellPhotos, contact us by completing and submitting the form below. If you are looking for a specif part number, please include it with your message. 1827 Photo Washington. From the original portrait painted by Rembrandt Peale / Drawn on stone by Rembrandt Peale ; Litho of Pendleton, 9 Wall St. Print shows bust portrait of George Washington.